This empty cicada skin caught my eye. Click on the photos to enlarge. 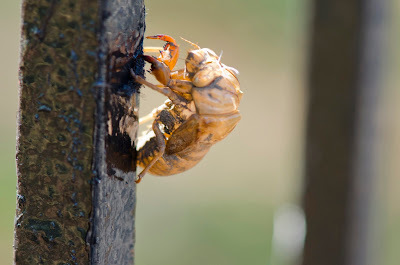 A few feet away on the same fence, I found this fresh looking cicada. It probably shed that skin a short time ago. 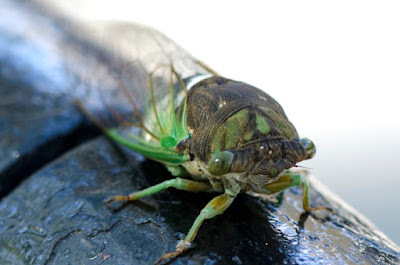 It is one of the group of cicadas called dog day or annual cicadas that appear from June to late summer. 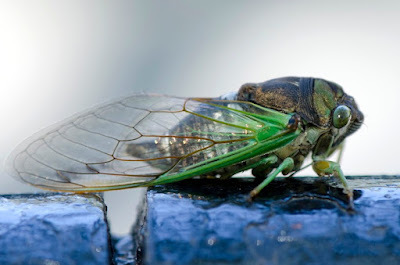 This one is Neotibicen tibicen, called the morning cicada because the males sing early in the day. It is about 2 inches long. Notice the three ocelli or eyespots on its forehead, between the 2 large compound eyes. The famous periodical cicadas, the ones that emerge in 13 or 17 year cycles, are smaller and have red eyes and emerge earlier in the year. Here is a periodical cicada from the 2013 emergence, for comparison. Click here to read my eye-witness account of that event. Some annual cicadas appear every year. But the life cycles of individuals take from 2 to 5 years, beginning as eggs laid in slits on tree branches. A nymph hatches, falls to the ground, and burrows down. It lives underground, sucking juices from plant roots, and grows. Eventually it reaches its last nymphal stage and claws its way upward to make an exit tunnel. It climbs onto something and sheds its skin, and emerges as an adult. The males settle down and sings to attract females to mate. Different species of cicadas sing different songs and at different times of day or night. They sing with an organ called a timbal which is made of ribbed membranes that change shape with a click when pulled on by muscles. The clicks are magnified by various hollow chambers in the insect. The dog days of summer were named by the ancients for the appearance of the dog star in the sky near dawn in July and August. We are in the dog days now; it's hot and humid, and the nights are loud with the songs of dog day cicadas.